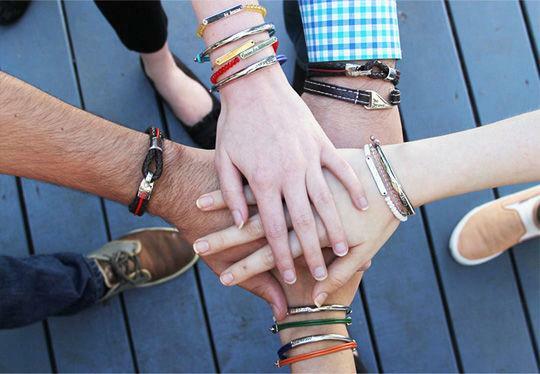 Bravelets Bracelets Raise Awareness with FAACT! The triangle is the strongest geometric shape. Bravelets jewelry is made to help you be strong and brave in tough situations. Therefore, Bravelets and triangles are a perfect pair. The triangle is incorporated not only into the Bravelets logo, but also in every item’s design. Plain and simple, the triangle represents strength, just like Bravelets. Bravelets is giving back to FAACT, and the fundraiser will be ongoing! Order your Bravelet today in time for Food Allergy Awareness Month – and 25% of your purchase will be donated to FAACT. Thank you for supporting Be Brave and our “KnowTheFAACTs” about Food Allergies fundraiser!